January | 2013 | ohdenny. 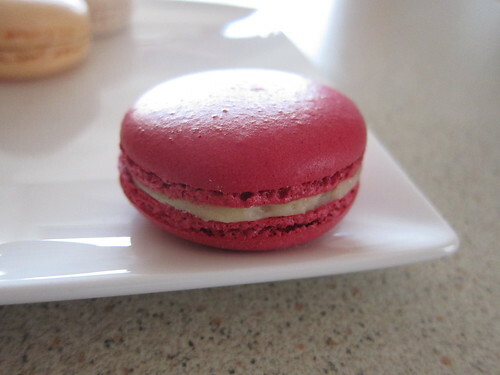 I saw this recipe on TV on Everyday Gourmet, with former Masterchef contestant Justine Schofield. What attracted me to the recipe was the ingredients she used, adding sambal oelek made me quite curious to taste how it would turned out. 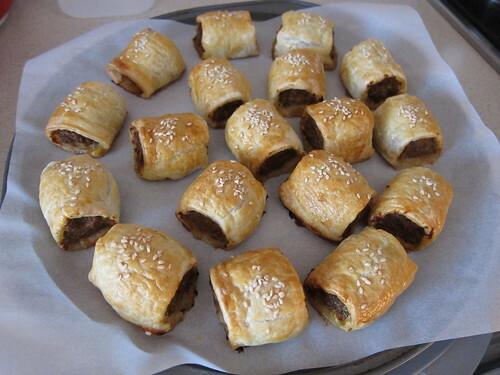 It also looked delicious when the sausage rolls were taken out of the oven. I thought why not give it a try, it’d be way better than those frozen/Four and Twenty/tucker shop varieties. 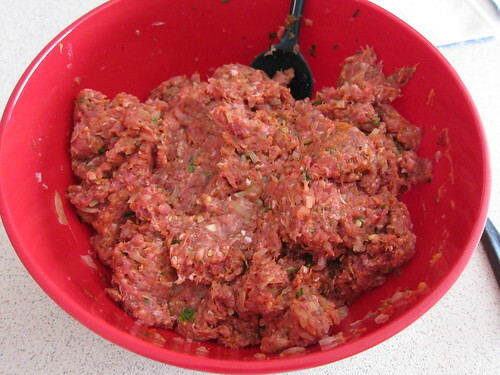 My primary difference was using Beef Mince, along with Beef/Pork Sausages (With no skin) as noted below. 1. Pre heat the oven to 200C. Lightly grease and line a large baking tray with baking paper. 2. In a large bowl mix lamb (beef) mince, sausages, fennel seeds, tomato paste, sambal oelek, onion, grated carrot, parsley and 1 egg. Season well with salt and pepper. With your hands thoroughly combine the meat mixture. If you want to taste whether or not the seasoning is to your liking, try taking a small spoonful of the meat mixture and cooking it (pan/oven/microwave) but if using a microwave make sure it’s cooked all the way through. 3. Cut pastry sheet in half. 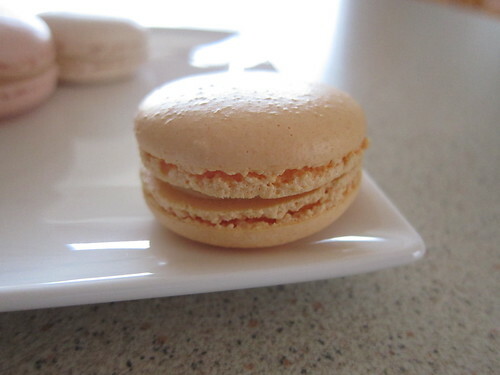 Place one quarter of the mixture along the length of the pastry pressing together tightly. 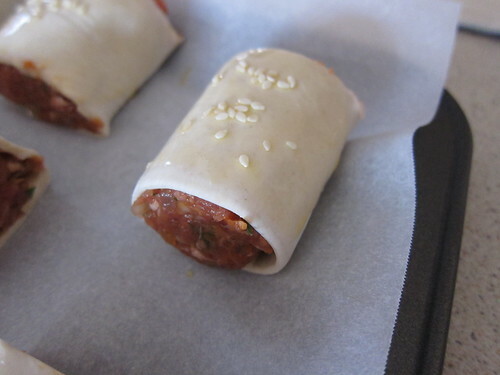 Roll the sausage roll log until the meat is completely covered with ½ of pastry. Cut excess pastry. 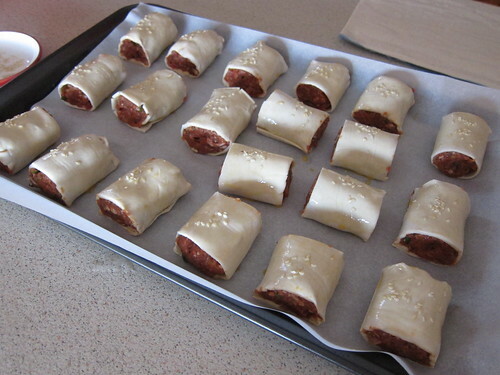 Cut into 4 pieces and place on the baking tray.Repeat the process with the remaining ingredients. 4. 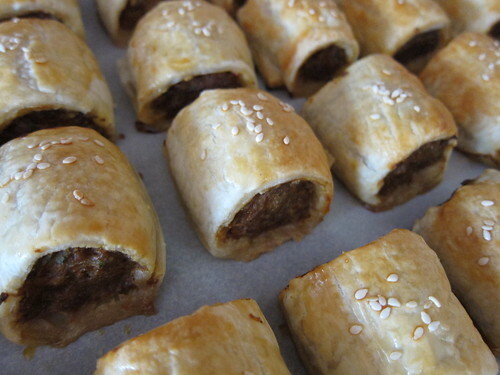 Brush some lightly beaten egg over the mini sausage rolls and sprinkle the sesame seeds on top, cook in the oven for 20 minutes or until the pastry is golden brown. Serve with your favourite tomato chutney or sauce. I loved this recipe! Having the sambal oelek in the recipe makes the difference, It simply cannot be ignored. 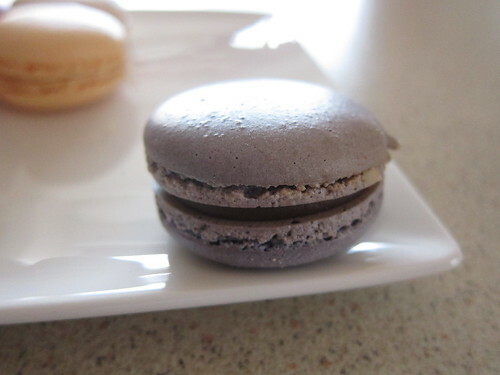 I saw in Justine’s pictures that she sprinkled what looked like black sesame seeds on top but I wasn’t sure. We didn’t have any so I used the white variety instead, made it look better (I think). You may notice that the fat from the sausages/ mince etc liquifies and spills on to the baking paper. This is what happened with mine, I just scraped it off from the bottom and cut it off from the sausage rolls and re-plated it. Using beef does give it a strong beef taste but I think some will enjoy it, as not everybody seems to like the taste/smell of lamb. Wong’s Lucky Bar is an extremely popular eatery in Box Hill, right next to the tram stop. They serve Chinese food, but one of their main attractions is their cheap Crab. I believe it’s around $13 dollars a pound, and $5 extra for noodles for each person. Bookings are essential for dinner as seats fill up quickly and queues can start to form early. You’ll find the interior to be slightly strange with seating placed anywhere possible. They even use the next door’s cafe for seating! Wong’s Crabs’ can be cooked a variety of ways, we ordered the Singapore Chilli Crab with noodles as I love Chinese Crab with noodles. While it looked mouth watering, the taste of the crab was lacking. You could hardly taste the crab meat but the Chilli Crab sauce was decent. 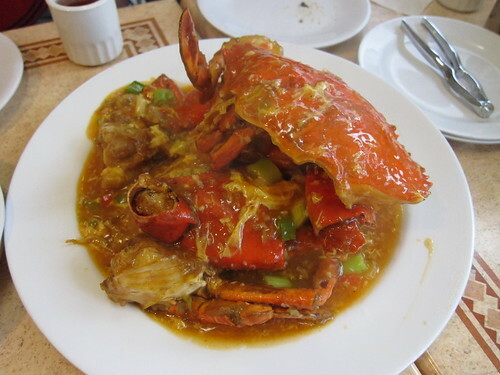 I wished it was more flavourful and spicy but the sweetness of the sauce was there and it accompanied the crab well. I think you basically get what you pay for so don’t go looking here for the freshest, most tasty crab meal as you won’t find it here. We tried the Crab at All People Chinese Restaurant in Burwood East, and that was incomparable to here. 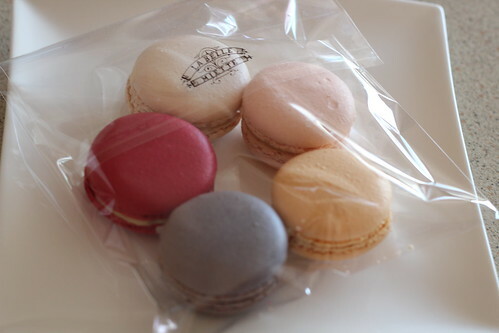 Extremely tasty but the price difference is also world’s apart. As out accompaniment, we ordered Balachan Spinach. This had a lot of zing to it as a result of the addition of chillies. Nicely cooked and flavour was excellent. A tad oily but it’s like any Chinese restaurant. If you want cheap(ish) food, served relatively quickly and don’t mind the chaos and almost non existant customer service Wong’s Lucky Bar is the place for you. 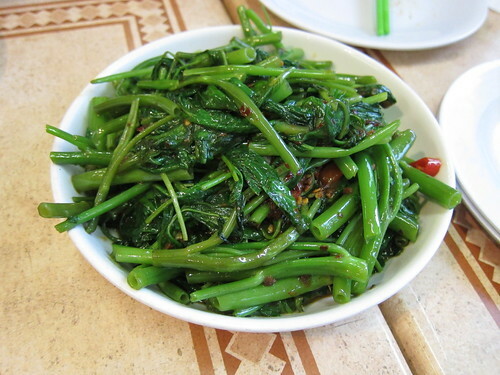 They have a wide variety of seafood dishes and other standard Chinese dishes to cater to many. Give it a try! 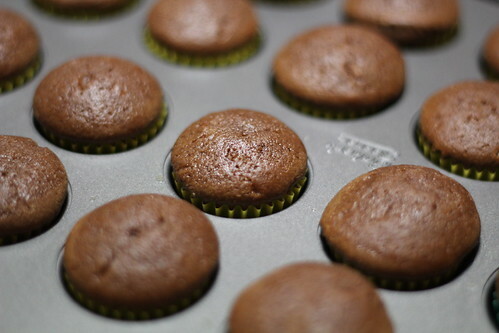 Orange and Chocolate go so well together, so I decided to try to bake some mini cupcakes. 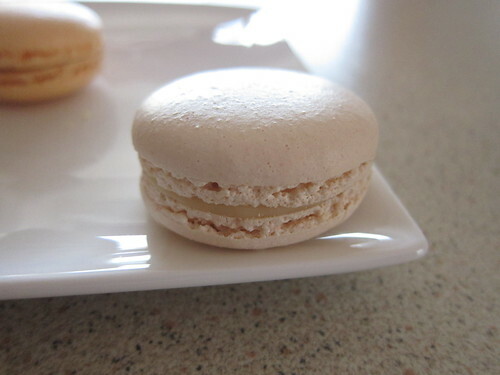 The recipe I used also had a orange and white chocolate buttercream icing on top but I thought I’d try it without it. Sometimes cupcakes just don’t need icing. 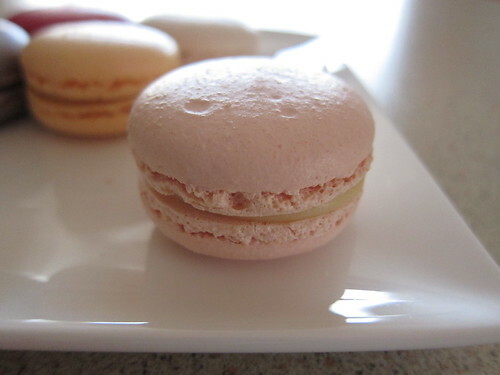 I found this recipe off BBC Food which has many interesting recipes to try, luckily they also have both the metric and imperial measurements. 1. Preheat the oven to 170C/325F/Gas 3. Line a 12-hole muffin tin with paper cases. 2. Mix the flour, sugar and baking powder together in a food processor. Add the butter and pulse until combined. 3. Whisk the melted chocolate, egg and milk together in a jug. 4. 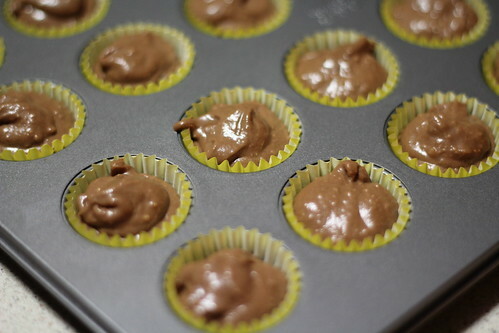 Stir the chocolate mixture into the flour mixture until just combined. 5. Spoon the mixture into the cases and bake for 15-20 minutes, or until risen and golden-brown and a skewer inserted into the middle comes out clean. Remove from the oven and set aside to cool for 10 minutes. 6. Meanwhile, mix the orange juice and granulated sugar together in a bowl. Carefully pour the orange juice mixture over the warm cakes and set aside to cool completely. 7. For the white chocolate and orange buttercream, beat the butter in a bowl until light and fluffy. Carefully stir in the icing sugar and continue to beat for five minutes. Beat in the milk, melted chocolate and orange zest. I found the recipe did require the buttercream icing on top because the orange juice mixture didn’t really soak through the cupcakes. They basically just slid off the tops. It also gave the cakes a slightly damp feel to them as a result. The chocolate flavour was quite good though, perhaps its because the recipe requires chocolate and not just cocoa powder as some recipes do. With the orange juice mix you can taste it slightly but just not enough. I think I’ll try making it with an orange buttercream but without white chocolate as white chocolate tends to be extra sweet.